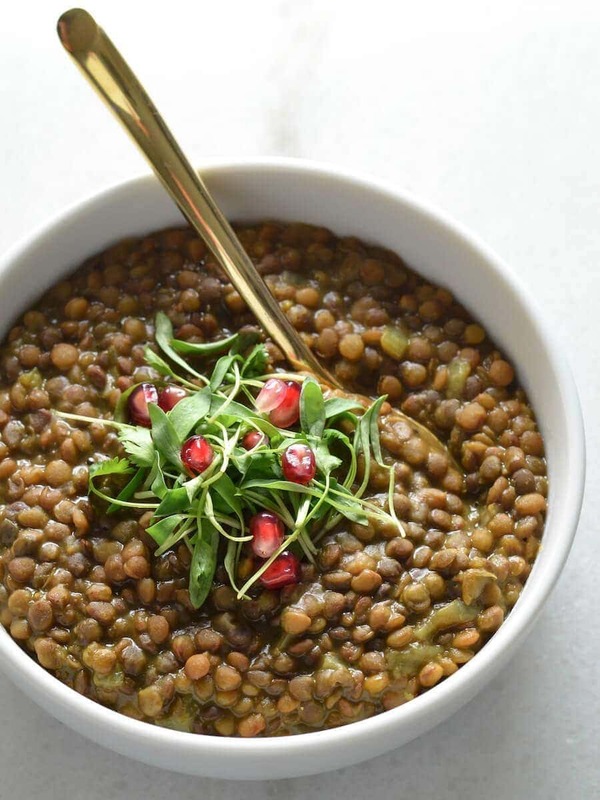 This lentil soup is easy to make with the Instant Pot or any other pressure cooker. They are warm, cozy, and pair really well with a size of brown rice or cauliflower rice. Cooked with healing spices turmeric, coriander, ginger, and cumin, this is a great recipe to have handy for weeknights. Lentils have a special place in my heart, probably because I’ve been eating them for as long as I remember. Growing up in Kansas as a strict vegetarian, there weren’t many options outside so I mostly ate my mother’s delicious Indian food…and boy did we have a lot of lentils (or “daal” in Hindi) growing up! My mom would always (and still does) make them in her good old fashioned Indian cooking pressure. If you’ve never used one of these, they can be pretty intense (and a little scary), especially when the pressure builds up and the whistle starts going off. You always need to be on standby and you always want to be pretty careful with it. When I left for grad school, my mom packed one of her pressure cookers for me to take along for the ride. I’ve been using the same one for the last 15 years (they clearly last quite a while) until recently! Now I’m hooked to my new Instant Pot. For awhile, I was using it to cook chickpeas in it, but now I use it for everything! I got my Instant Pot back in November on Black Friday. I was SO excited about it and shared a lot about it on Instagram Stories. Amazon was selling it on sale and I immediately ordered one. I’ve been thinking about getting one for a solid year before I pulled the trigger and hit purchase (but really, it just took it going on sale). Two months later, the Instant Pot has completely replaced my old pressure cooker and I’m still wondering why I waited so long to get one. Note that I love and appreciate it probably more than most people that have never used a pressure cooker in their life. I’ve read a lot of folks complaining about how it’s not that quick or “instant” when you factor in the time it takes to build up the pressure, but hey, that’s what a pressure cooker does – it has to build pressure and there’s no around that (yet, at least). I can set it, forget it, and then come back to it when I’m ready to eat. I’ve been barely using canned beans ever since I got my Instant Pot. Cooking beans take a fraction of the time. Easy cleanup. I can throw some of the pieces in the dishwasher, easy peasy. Now that we got that out of the way, you’re going to love this recipe. Lentil soup is the first Instant Pot recipe on my blog for good reasons. Lentils offer a great source of protein, especially if you’re a vegan (or a vegetarian like me). This recipe uses Indian spices, has plenty of flavor, and will surely become one of your favorites. You can add/remove any ingredients that you don’t have or want to use. I sometimes like to use tomatoes in it as well, but for this recipe, I stuck to the basics. 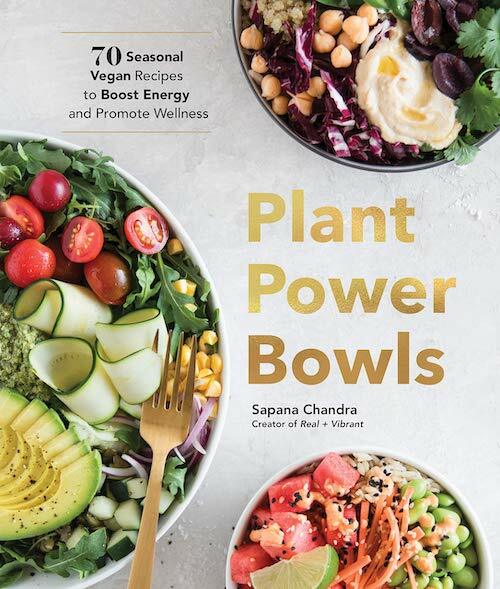 Best of all, using the Instant Pot will give you the same results every single time, which is pretty amazing in itself. Again, these are just a few of the benefits I find interesting and that keep bringing me back to lentils. 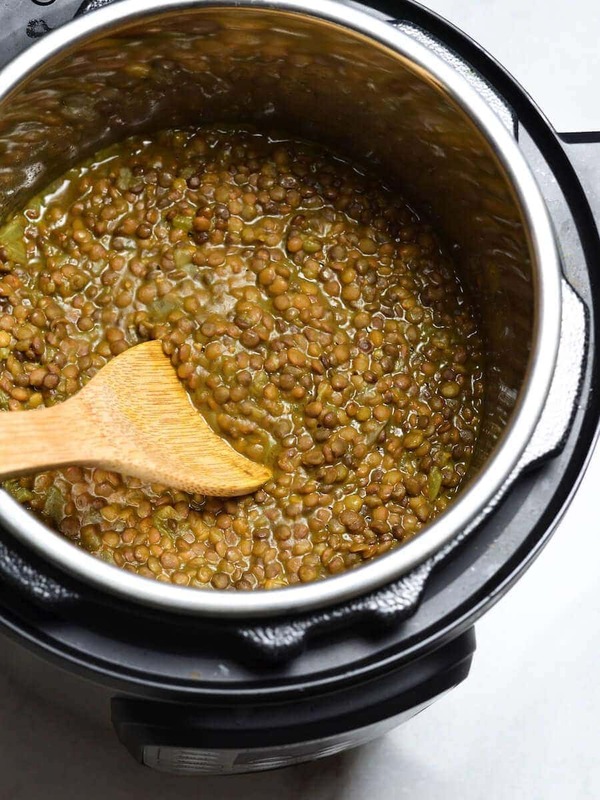 These lentils are so easy to make with the Instant Pot or any other pressure cooker. They are warm, cozy, and pair really well with a size of brown rice or cauliflower rice. Cooked with healing spices turmeric, coriander, ginger, and cumin, this is a great recipe to have handy for weeknights. Click the “Saute” button on the Instant Pot. Add avocado oil. 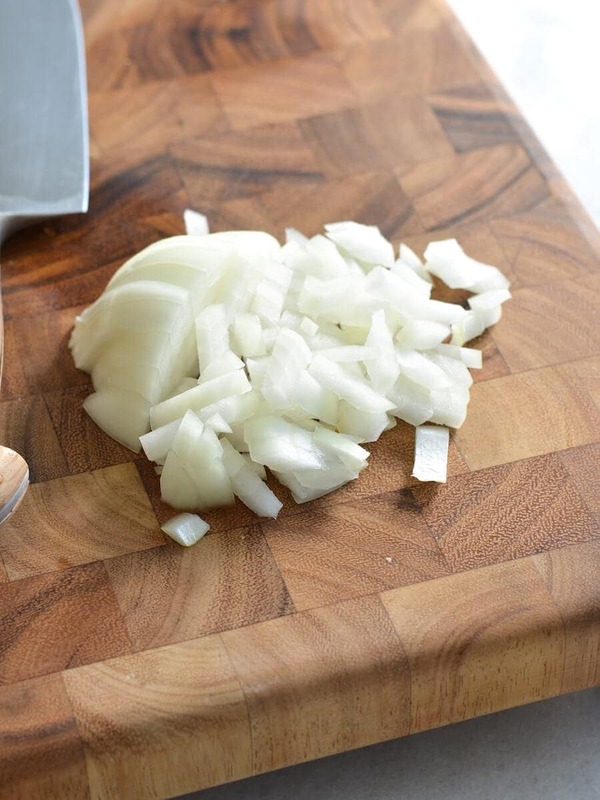 After a minute, add the chopped onions. Stir the onions until they are well coated in the oil. Stir frequently for the next few minutes, until the onions start to become translucent. Mince the ginger, if using fresh, and add it to the Instant Pot. Add the ground cumin, ground turmeric, sea salt, and black pepper. Toss the onions in the spices until they are well coated. Add the lentils, stir a few times, and pour in the water. Turn off the Instant Pot by pressing the “Off” button and place the lid and lock into place. You should hear a sound when it’s locked into place. Now, click on “Pressure Cooker” and set the time for 25 minutes. If you’re not planning to eat for awhile, feel free to use the “Keep Warm” button to keep it warm. That’s it! Note that it takes about 10-12 minutes for the pressure to build up before the 25 minutes will start, so plan accordingly. Once the timer is up, the Instant Pot will turn off on its own (unless you set it to “Keep Warm”). At this point, you can either rapid release pressure (be careful doing this and do not touch the lever directly) or let the pressure release on its own. I always let it release on its own unless I’m in a hurry. Either way, be really careful not to burn yourself and make sure you’ve read the instructions on how to perform this task before attempting to do this. 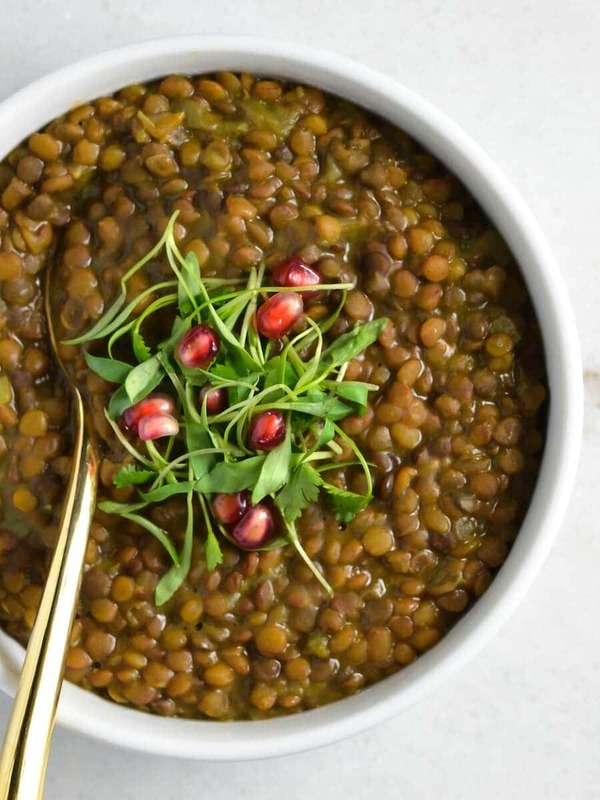 Once the pressure is completely released, be sure to turn off the Instant Pot if it’s on “Keep Warm” and open the Instant Pot and stir the lentils. Add the lemon juice and stir again. Adjust the salt and pepper, if needed. Add more lemon juice for more tanginess, if desired. The lentils are ready to be enjoyed, either alone or as a side. I love enjoying them with cauliflower rice or brown rice. 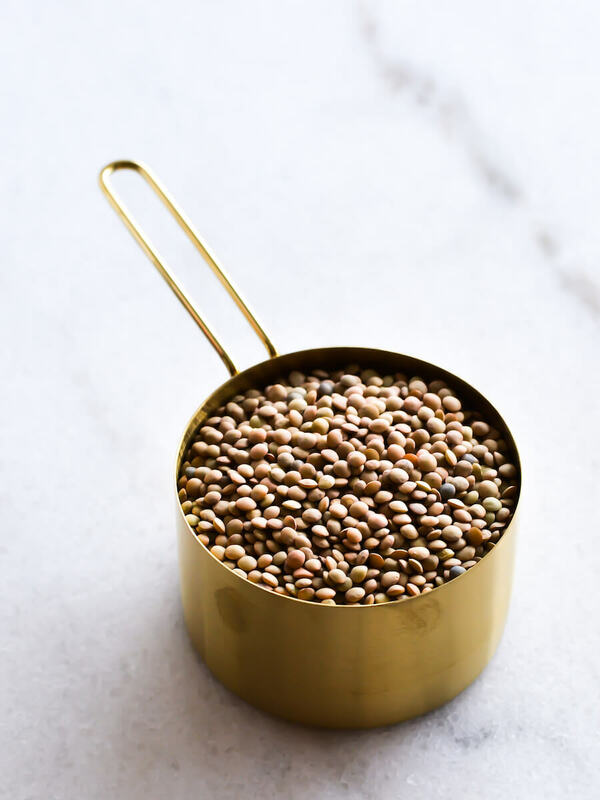 Store the remaining lentils in an airtight container for up to 3-4 days. How could we make this if we don’t have a pressure cooker?